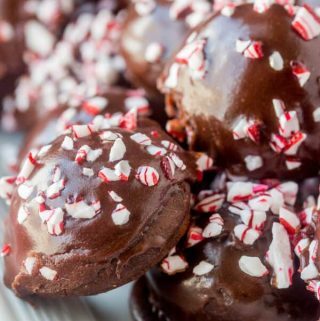 Hand-held and delicious these Chocolate Peppermint Donut Holes are a quick, easy and tasty holiday breakfast or dessert recipe. Spray a 24 count mini muffin pan with non-stick cooking spray, set aside. In medium bowl, whisk together your flour, cocoa powder, baking powder, salt and sugar. Add in your egg, sour cream, milk, butter and vanilla and stir until blended. Add your donut batter to a piping bag and snip the tip off. Pipe into prepared pan about 1/2 way full. Bake for about 10 minutes, remove from oven and let cool. Meanwhile to make your icing, mix together your melted butter, cocoa powder and vanilla until combined. Slowly whisk in your powdered sugar to ensure no lumps (if it appears too thick, microwave it for about 30 seconds). Dip your cooled donut holes in icing and sprinkle with candy cane pieces. Let sit for about 10 minutes to harden.